"Regardless of what students do after graduation, they must have the ability to continue learning," (Simmons, 2009). When we think about 21st century learning we often think of technology, and technology is constantly upgrading. I have heard many colleagues joke that there is no point in buying the most recent technology because it is outdated as soon as you've purchased it. To a certain extent this griping rings true, if our students are to be successful in the workforce it is almost certain that they will not only need to be technologically proficient graduates, but also possess the ability to be flexible and learn how to use new technologies as they emerge. Being proficient in technology also requires an understanding of the somewhat abstract concept of a "virtual world" that affects us, and millions of others we will never meet, based on what can be achieved via cyberspace (Zhao, 2009). Our schools are beginning to move toward providing more opportunities to interact with the virtual world - some teachers use Edmodo, a class twitter, Skype or email pen pals with international classrooms. While considering how educators can use a biliteracy program to help close the achievement gap for English Language Learners, two components of 21st century learning stand out. 21st century literacy requires both the development of digital literacies as well as foundational text literacy skills. The two are not mutually exclusive. “Before students can engage with the new participatory culture, they must be able to read and write. The new literacies almost all involve social skills developed through collaboration and networking. These skills build on the foundation of traditional literacy skills taught in the classroom,” (Jenkins, 2009). "In a biliteracy environment, the theories of literacy development used to drive instruction are more complex than in monolingual classrooms." In a biliteracy environment, the theories of literacy development used to drive instruction are more complex than in monolingual classrooms. Teaching to read and write in English and Spanish involves some of the same methodologies and strategies; for instance, information processing models, metacognitive strategies, or emergent literacy theories promoting the development of listening, speaking, reading and writing as interrelated skills. However, the internal structure of each language is different (Escamilla, et. al., 2014). Syllable awareness emerges before phoneme awareness in Spanish and is a stronger predictor of reading success. The role of syllabification in English is not as strong as in Spanish. Vowels are the first building blocks of Spanish literacy, consonants the second. In contrast, the building blocks of English are the names and sounds of each letter. In English, children start by learning consonants, but in Spanish they start by learning vowels. Learning letter names in Spanish is less important than matching vowels to consonants to form syllables. In Spanish the five vowel sounds are consistent and do not change their sound when paired with consonants. In contrast, English vowel sounds change depending on the word pattern and their consonant pairings. Our current model of dual language instruction often relies on instructional strategies and material that were originally devised or published in English, and were then translated into Spanish for the Spanish half of literacy instruction. Teachers use teaching methods mostly native to the United States, even when teaching Spanish reading, which becomes problematic in several ways. Materials originally written to target English literacy patterns and development do not translate into Spanish appropriately. When accounting for differences in the internal structure of the languages, researchers "encouraged...methods to teach Spanish reading that are authentic to the Spanish language" (Escamilla, et. al., 2014). They acknowledge the importance of using approaches such as sheltered instruction in English (often referred to as SIOP: Sheltered Instruction Observation Protocol), especially in the content areas. However "research has concluded that it is insufficient for teaching literacy and language arts to emerging bilingual children", touting instead the need for direct instruction of both English and Spanish literacy. Of course there are schools in which this will not be possible, and there is much research to support the merits of sheltered instruction strategies in these English-only settings. Adherence to a 21st century curriculum, then, involves using best practices for each language taught in the program, as well as the development of digital literacy skills. Below is one example for how to expose students to digital literacy early on by tying digital publishing into the writing process. The following video and accompanying paper detail the positive effects of combining quality foundational literacy instruction with strong curriculum standards and digital publishing tools. Bear, D., Invernizzi, M., Templeton, S., Johnston, F. (2012). Words Their Way: Word Study for Phonics, Vocabulary, and Spelling Instruction (5th Ed.). New Jersey: Pearson. Escamilla, K., Hopewell, S., Butvilofsky, S., Sparrow, W., Soltero-González, L., Ruiz-Figueroa, O., Escamilla, M. (2014). Biliteracy from the Start: Literacy Squared in Action. Philadelphia, PA: Caslon. Jenkins, H. (2009). Confronting the Challenges of Participatory Culture: Media Education for the 21st Century. MacArthur Foundation Series on Building the Field of Digital Media and Learning. Cambridge, MA: MIT Press. Simmons, T. (2009). Suspending Disbelief: World Class Public Schools for All. Rep. Raleigh: Wake Education Partnership. Retrieved from http://wakeedpartnership.org/wp-content/uploads/2014/03/Suspending-Disbelief-2.pdf. Tracey, D.H., & Morrow, L.M. (2012). Lenses on reading: An introduction to theories and models (2nd ed.). New York: Guilford. Vogt, M., Echevarría, J. (2008). 99 Ideas and Activities for Teaching English Learners with The SIOP Model. Boston, MA: Pearson. Banner: Theory Into Practice [photograph]. Retrieved February 27, 2015 from http://blogs.brandeis.edu/gps/2014/06/24/a-first-look-at-the-new-degree-transforming-online-education/. 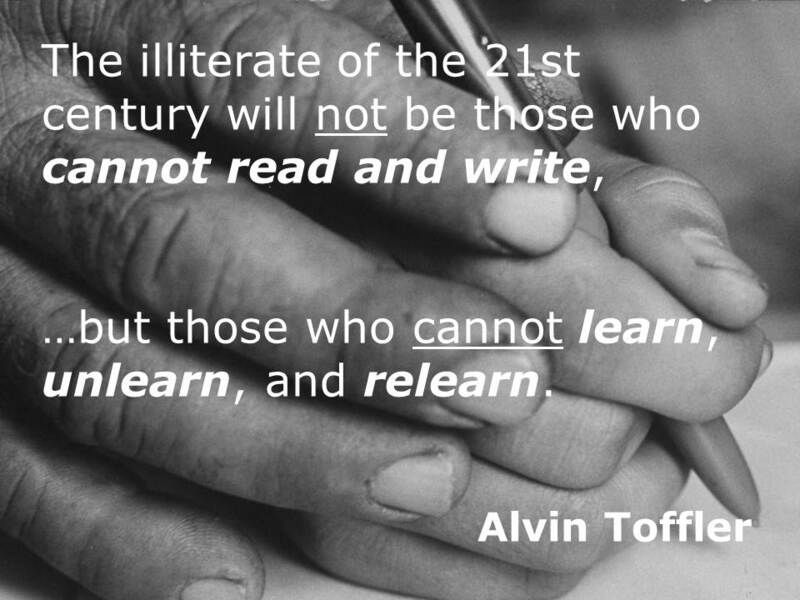 Left: Toffler Quote [photograph]. Retrieved March 1, 2015 from https://allthingslearning.wordpress.com/tag/deep-learning/.